Under the Golden Gate Bridge at sunset. Mmmm, lovely. Such a beautiful piece of form and engineering. It reminds me of the time my friend Russell and I hired a power boat and operator to take us from Pier 1, out to the middle of the bay and through the Golden Gate bridge and then towards the ocean, at least until the waves were too rough for the boat. We made several dozen stops taking 360 degree still photos which we then arranged to be shown in four slide projectors. It was for te 1989 Spiral Dance ritual, and the photos were used to take the circle from the pier where the ritual took plae to the land of the dead. Appropriate transform shots into the westering sun led us to the island and the Apple trees. 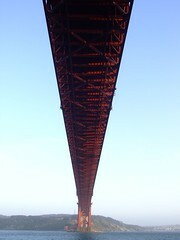 If only I could find the slides, as there was a splendid shot of the bridge from underneath it.